Is that within your thermal specifications, Apple? Mere hours after Apple assured the world that the new iPad 3 tablet doesn't have an overheating problem, new tests have clocked the device running at a staggering 116 degrees Fahrenheit. The independent, non-profit Consumer Reports organisation took the measurement with a thermal imaging camera after playing Infinity Blade II for 45 minutes while the device was plugged in. The consumer champion says its findings came in at 13 degrees higher than the hottest temperature reached when using an iPad 2 and, indeed, well above Apple's own thermal specifications. The report says the hottest areas are concentrated around certain corners of the tablet, but also points out that the temperatures caused no user discomfort. Consumer Reports says: "The hottest areas weren't evenly distributed throughout the iPad's back, but were concentrated near one corner of the display as shown in the images taken from the rear of the device above. 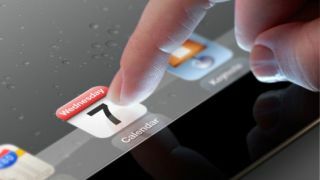 "During our tests, I held the new iPad in my hands. When it was at its hottest, it felt very warm but not especially uncomfortable if held for a brief period." Earlier on Tuesday Apple released a statement in response to widespread complaints that tablets were running hot, with one website reaching a low-by-comparison temperature of 92.5 degrees Fahrenheit (33.6 degrees Celcius). Cupertino says the new iPad operates "well within our thermal specifications," which officially range from 32 to 95 degrees. Now, you don't need us to tell you that 116 degrees (46.67 Celcius) is quite a bit hotter than 95. In layman's terms, it's the difference between a discomforting sunburn after a day at the beach and, quite probably, some quite severe skin cancer. So now the new iPad has been proved to far exceeded Apple's own guidelines, can we officially say that the new iPad 3 does indeed have an overheating problem?